I Test Drove AirPods With Every Style of Earring. Here’s the Verdict on What Pairs Best. Do you know what’s truly magical? Being able to wear your AirPods and earrings at the same time. The latest in wearable technology is here. You either passed somebody wearing them today, or you're the proud owner of them yourself. Maybe they're in your ears at this very moment. I'm talking, of course, about AirPods. Apple sells the headphones for $159, marketing them as "Wireless. Effortless. Magical." But do you know what's truly magical? Being able to wear your AirPods and earrings at the same time. Though they are wireless and cover only a small part of your ear, that's easier said than done. While weighing my own purchasing decision, and as a daily earring-wearer, I took my friend's AirPods for a run with all my earrings. The AirPods cover where primary earlobe piercings are usually placed, and you might risk losing your headphones if they're bumped out. Feel free to carry on with your secondary, third and whatever other funky ear piercings you have as usual—in fact, since you won't often take your pods off, consider them a new kind of stud. As for the old kind, stay away, unless you want to hear a clicking sound in your ear throughout the day. The main factor here is diameter. Hoops are one of your best options, but go with a classic hoop over a '90s-inspired oversized hoop to avoid the aforementioned clicking. Aesthetically speaking, not every color goes with stark white. But metallic tones are always a nice, sleek option. What's more glamorous than white and gold? Not much, especially when you're talking wearable tech. There are studs, there are hoops, and then there are those that dangle beneath our lobes. Bulbous, tassel and geometric earrings are everywhere right now, and these are safe for pairing as long as they don't have a post. Second in the category of dangly earrings are threaders. Typically made of metal, it's hard to argue the simple charm of a little silver, gold or rose-gold thin chain or shaped wire dancing above your shoulders. Thin by nature, lightweight and easily styled, threaders are one of my favorite pairings with the Pods. Some of the best threaders come with charms at the end. But the best charm of all might be the AirPods themselves. 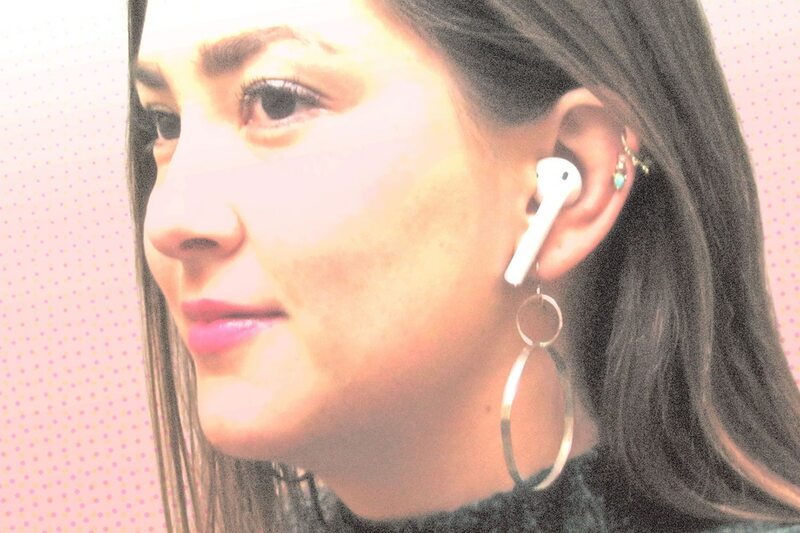 Gabrielle Reilly, a 22-year-old paralegal from Virginia, went viral on Twitter when she posted a video of herself in AirRings, which were originally a way to be sure not to lose the AirPods. She has since created a website selling custom AirRings in silver or gold, in hoop, fish-hook or clip-on styles. Earring styles aside, I know I'm not the only one who had questions about potentially harmful electromagnetic radiation exposure from the devices being in your ears for prolonged periods of time. Though information is relatively new on the topic, University of Pennsylvania bioengineering professor Kenneth Foster told the Los Angeles Times the electromagnetic field exposure from Bluetooth technology used in AirPods is "absolutely minimal—smaller by a huge amount than the exposure of putting a phone to your ear." For those who want to explore EMF-repellent crystals for protection regardless, try wearing black tourmaline or shungite, both known to counteract EMF radiation pollution. Hematite and pyrite have both been found helpful as well. As far as my shopping decision, it is still up for debate whether I'll buy AirPods or not. The longer-term health safety and convenience factor are almost more convincing than anything. For now, I'll be untangling wires, chatting on speaker phone and wearing my favorite stud earrings for a while longer. Jyssica Yelas is a style writer and social media strategist who believes in cat cafes, sustainable fashion and a more colorful Portland. She usually has a pair of circular glasses and her cell phone handy, but would love some advice on keeping her bromeliad alive.